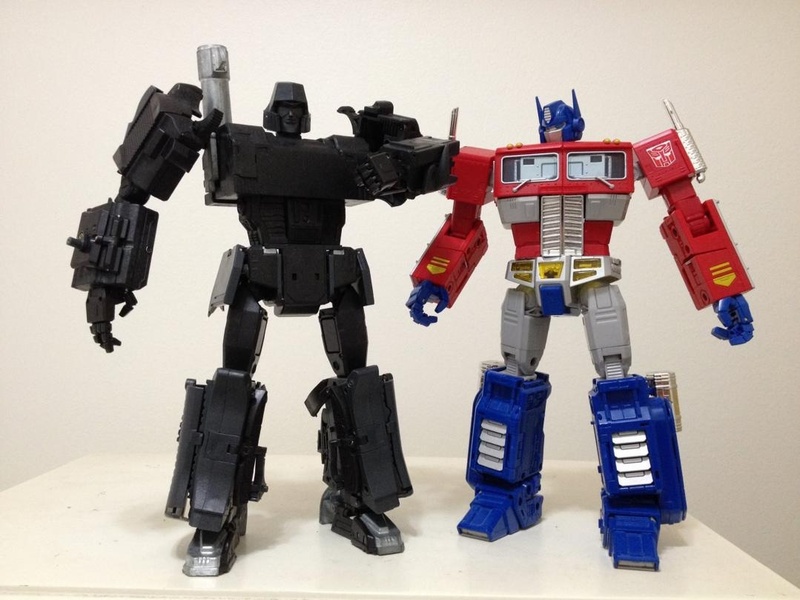 Discussion in 'Transformers 3rd Party Discussion' started by primushatesyou, Oct 25, 2014. I will list all the differences from what I have seen from my two. Chest Dimples, least on this one are gone. Paint is crisper. Same color, just looks as though they found a better way to apply it. Also no scratches any place on him. Head is no longer overly tight to turn. Also easier to move in and out when transforming. Everything tabs together more snugly on this one. His arms, I took apart to see why they seemed tighter with little hang. The Ball Socket was re-cut, and where it sits in is much more snug. I put a coat of tamily clear on it just to be safe, and it is almost as tight as mine with the replacement on, but is not so tight it might break. Feet, and heals are more snug. They used different pins from the looks of it. Cannon now sits flush to his arm. No more gap. Transforms a little smoother. If you put the head in after you move the arms for transformation, the chest doesn't stick. Peg in the waist area are not so hard to get into place now and hold his legs firm in bot mode. You can pick him up by his arms now and they don't just up and pop off. Those are what I have noticed so far. I know I am missing something else, but can't think of what. If I see anything else I will update y'all. Additional Adapter: If you're wondering what the aditional black adapter is for. This was added at the last minute. To convert your alt mode accessories into the secondary battle stand. You'll notice that one of the attachments is a (+ to o). This adapter fits between them so that they can be attach. If you configure your accessories in apollyon's battle stand where the handles are at his handheld level, this adapter is not needed. DoctorsTARDIS has put together a gallery of every picture of Apollyon he could find. He said he will continue to add to it as new pics come in. Now this has got me intrigued, I need to see this thing transform lol. You don't have a 3d animation of the transformation do you? 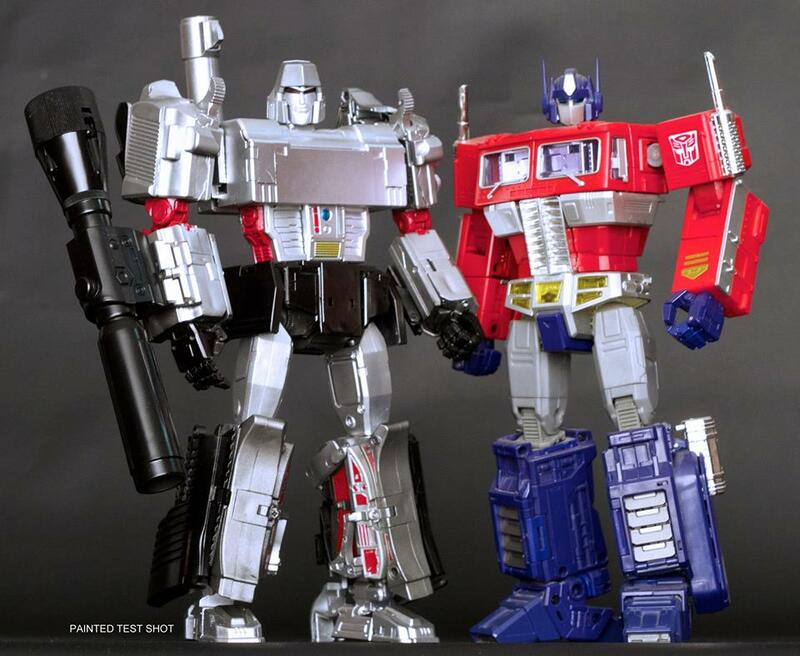 Someone was asking if you knew how much die cast was in this figure and if you (in designing the figure) decided where it should go or if the materials were left up to X-Transbots? ha. no I don't have an animation of his transformation. I think that's an upgrade package with spaceclaim. Die cast is located in the feet. The barrel is die cast. And the "bars" that swing the arms around to either side of the chest are also die cast. The most important die cast parts are the bars that swing the arms. Because he's one of few, perhaps only character from that era that converts from a sideways position to a front facing one, the arms have to travel in one case the distance of the arm and the chest and the other has to travel the distance of the arm. MP03 did this brilliantly but I was trying to avoid copying as much as possible. 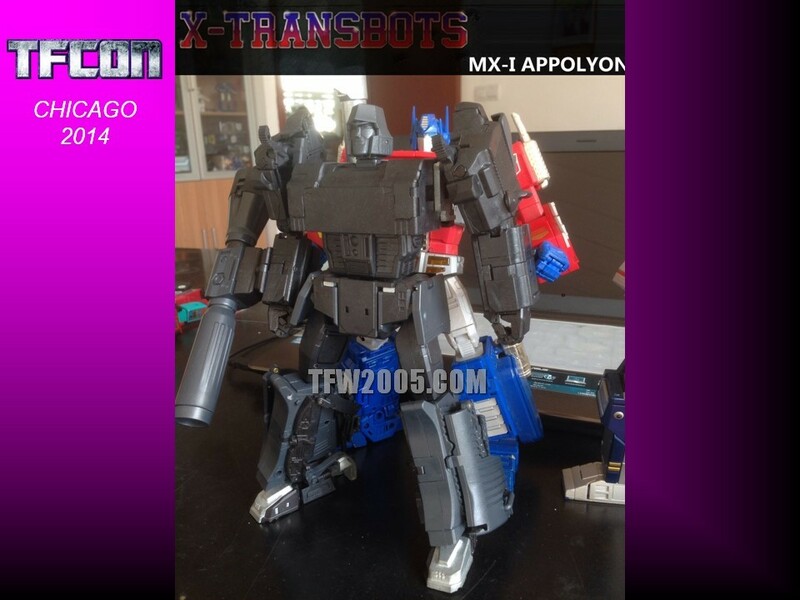 Some people are worried about Apollyon having loose arms, what steps (as a designer) did you have to take to try ensure this would not be issue? and what (in your eyes) were the defining moment when you knew you had nailed it? Tolerances are usually the responsibility of the factory engineers. Tooling and the right kind of plastic is key. Once the molds are completed, test shots are made. (These are always loose.) Molds are adjusted and tested multiple times, and this process takes a while. In some cases, designs are changed to improve the toy. These processes ensure against errors such as instances where initially pegs are too short, wall thickness is too thin, hinges don't have the proper clearance, etc. All this stuff is addressed at the factory and takes time. With Apollyon having almost 300 parts, testing, adjusting and perfecting all of them is a task that would drive any sane person over the edge. Factory engineers are the unsung heroes. I have a lot of respect for them and fans should too. It's a very difficult job. In terms of a defining moment: There were a lot of small "defining moments" and perhaps more "F it! I quit moments" throughout the process than I would like to admit. Once the lower legs were done, I felt like it was getting close. But I kept asking could it be better? Probably, but this was the best I could do at the time. The factory engineers really stepped up with Apollyon and improved on the design. 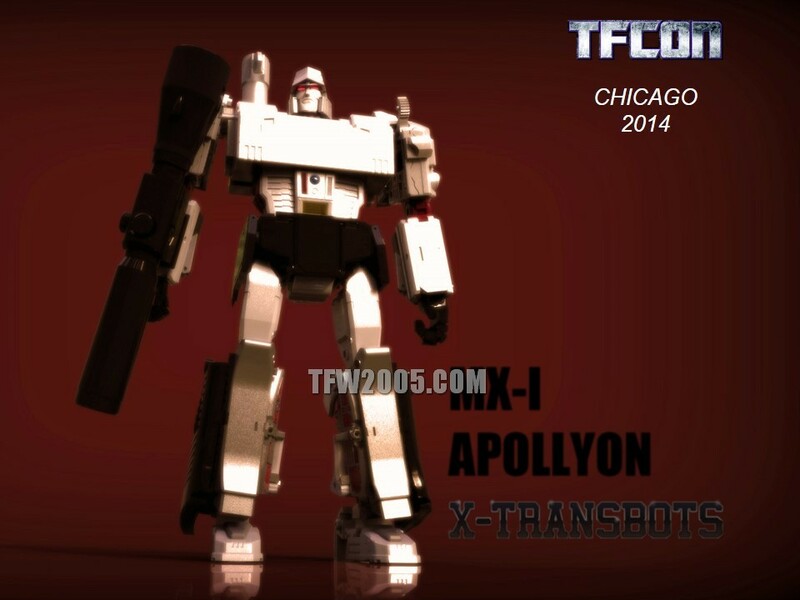 Apollyon was my 3rd figure after Krank/Stax and Ollie, and I was extremely timid to take it on. I'm glad XTB convinced me and am thankful they showed as much faith as they did. Krank and Stax have a special place in my heart but I learned a lot from them and read all the criticism. Ollie was tough since he was so small, animation was so different from the original toy, and the quality should have been better. Both myself as a designer and XTB as a company learned a lot from this and really took all the criticism into account. I have to make a correction to an earlier comment. The bars that swing the hips around to the crotch are also die cast and are quite needed. There's a lot of weight in the legs and having those bars molded in metal will be very important. By the way, thanks a lot for the replies, all this is very helpful. It also allows people to see the thought and consideration that has gone into making this. Which is always welcome, and appreciated. Im sorry about all the questions. I am trying to put people fears at rest, while getting honest information about Apollyon. I and (I'm sure XTB) really appreciate the interest and enthusiasm. Thank you for taking the time to gather people's questions. If you want me to ask him anything just wraith2021 know in a PM. 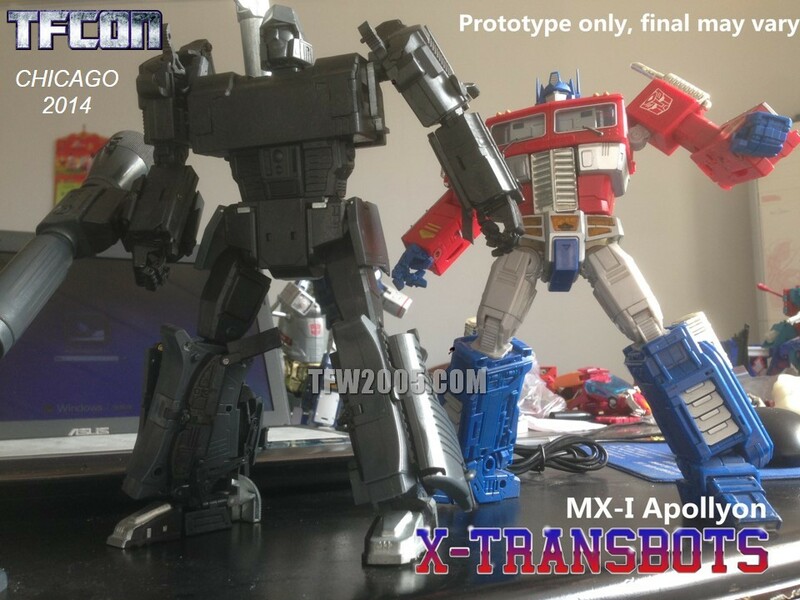 So did you designed the figure for X-Transbots? I must admit, this is one amazing feet of engineering. To produce such a show accurate Megatron that actually transforms into an almost perfect Walther P38 is amazing. 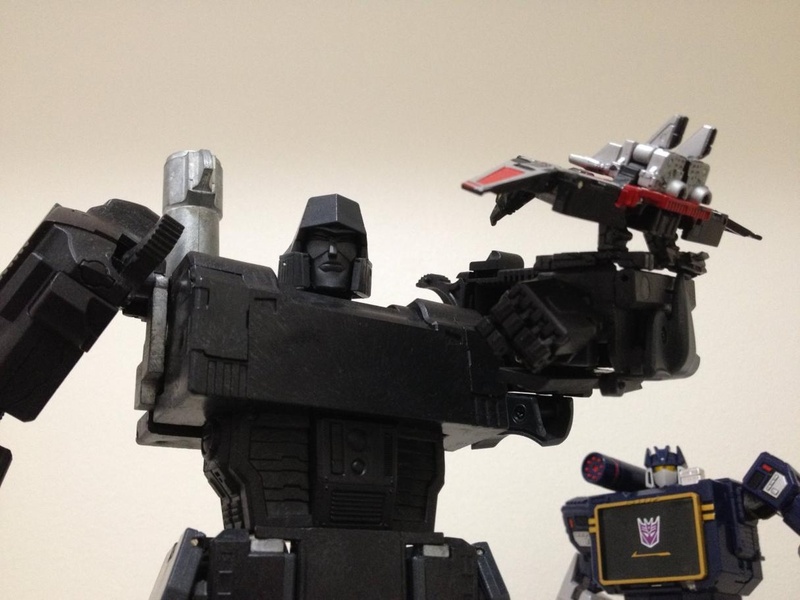 It puts Takara's MP-05 Masterpiece Megatron to shame. OH that's not fair. MP-05 was designed in a week I believe. I have tremendous respect for Takara's designers. I do find it odd that MP-01 was not based on a real truck to the benefit of the bot mode yet with MP05 they went with a real looking P38 and sacrificing the bot mode. 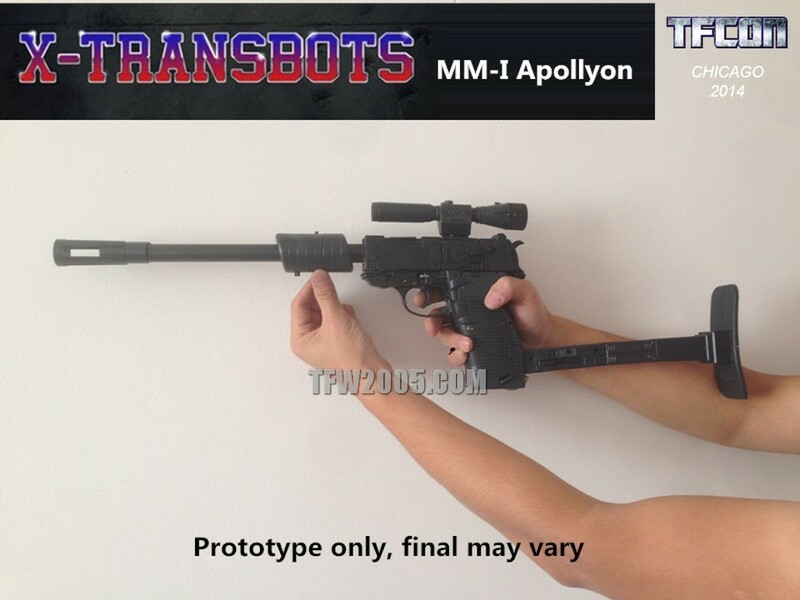 Apollyon's gun mode is wider. Sacrifices were made to the gun mode to accommodate the robot. There are a few questions I would like to clear up with people about the figure. Was their a reason his underpants block him from lifting his knee up into a sitting position? Is there a reason why ball joints on the arms were used instead of ratchets? Personally, I think this thing is an amazing piece, and can't wait to get him (There is only so many times you can watch the painted test shot video), but it would be nice to put people's assumptions to rest. I think what people don't understand is that especially with Apollyon, every change to one part affects multiple other parts, swivel points, clearances, wall thicknesses, etc. Furthermore it would affect the aesthetics of other parts. So thinner hips means thinner legs, means thinner arms, shallower chest, shallower abdomen, and a squished head. Having said that, I realize that every person has an idea in their mind what he should look like. My goal was to connect with as many of those ideas as possible while matching him with MP10 and given the limitations of the alt mode and cartoon models. Designing this took about 6 months while working a full time job and honestly i could probably still be working on it. There are almost 300 parts in all and in the end i just needed to stop and work on something new. The shorts have been lifted slightly since the initial test shots. He used to have the same forward movement as MP10. now he has about 80 degrees. Not quite the 90 degrees required to sit comfortably but this was a balance I had to strike between cartoon accuracy and articulation. Aesthetically, with the width of the hips set, shorter shorts would've made the hips look even wider. Forward flaps weren't added because of the way the side hips are molded. There wasn't enough space to create a universal joint because the way the arms tuck in together to form the back end of the gun. Universal joints requires two points of articulation and appropriate wall thicknesses. Ball joint require only one point of articulation. 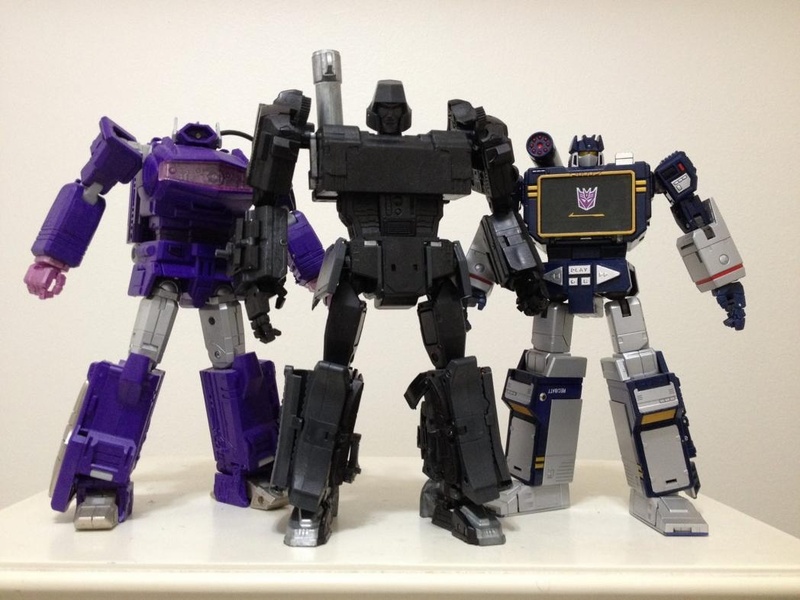 After struggling to find room for a universal joint strong enough and at the right location so the arms turned at the shoulder and not the biceps, I looked to MP08 for answers. After deciding to go with a ball joint, I just had to make sure it was tight enough to hold the weight of the canon (that's the factory's job). And I always loved the subtle nuances in articulation you can achieve with ball joints. Anyway, I hope that explains a bit. Thanks, for the response, it is much appreciated. Now the next question is regarding the legs below the knee. This is a sore point for some, and personally I think you nailed them. Was their anything particularly difficult you needed to overcome when doing his lower body? The lower legs were particularly tough. If you've ever wondered what the practical use of math in the real world was? Apollyon's lower legs are the answer. Cartoon accuracy can only go so far. At some point the legs had to transform into a believable handle. I can understand folks wanting them to look more cartoon accurate but the gun mode's appearance would have severely been compromised. Part of the handle end up on the hips and yet another part on the back of the arms. Hope that explains it. Box samples. We're getting closer! Huh. Not sure how I feel about this news. Is there a competition on at TFcon of 'who can take the crappiest photos'? If it is KFC then I'm psyched knowing how good Transistor is. Bring it! X-Transbots, apparently. Their QC with Ollie might not have been great, but he was still a great figure, and the plastic quality and Stax and Krank was very good if you ignore the odd colours and the problem with the arms popping off because of the chrome. It's only a blurred picture, but I have a feeling X-Transbots could surprise us with this one. Maybe it will be their Quakewave, at last? 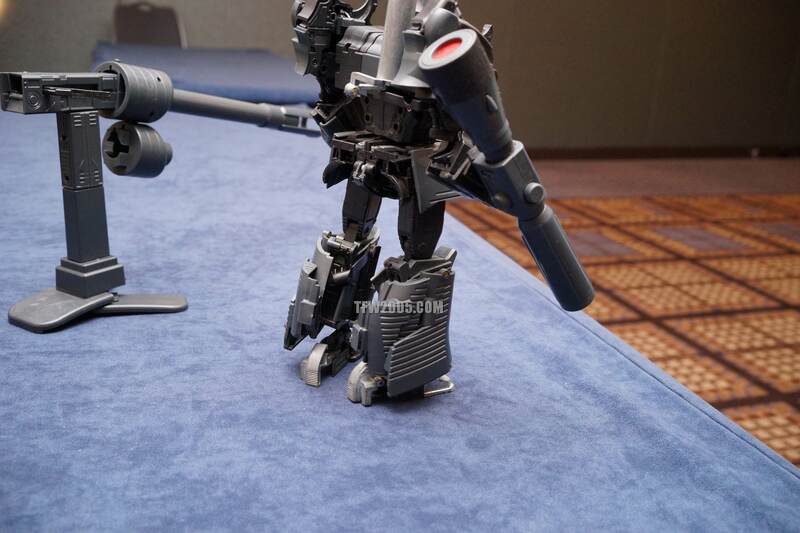 I'm hopeful - an MP Megatron is long overdue, and if this is as good as the blurred picture hints at, I'll happily take a third-party version. KFC's? So this is number 9 from the Mugan mold? From the slides they just posted, apart from his crotch being a little kibbly/out of proportion, this is fantastic looking. Even the head looks well executed! Was that picture taken with a potato? Oh, I can defiantly dig this. 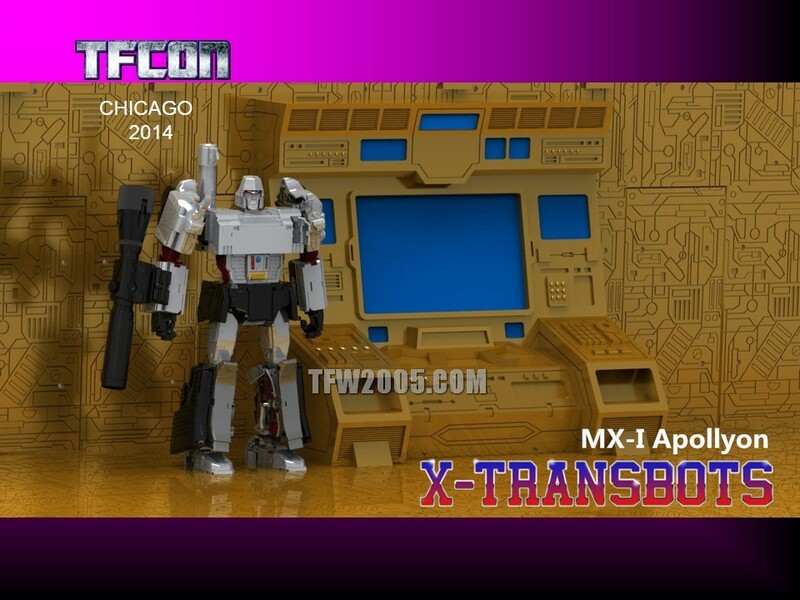 Yeah this one may have just won the 3rd party Megatron war. Not bad....one more figure to consider throwing money at.